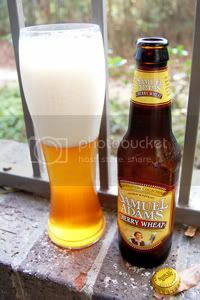 First brewed as a summer seasonal back in 1995, Cherry Wheat was popular enough to warrant year-round availability as part of the Samuel Adams Brewmaster's Collection. It's proved to be so popular that it's one of the best selling Sam Adams beers out there—it's certainly my wife's favorite. The sweet fruitiness of the cherries is balanced against the crisp, cereal note from the malted wheat and the subtle citrus flavor from the Noble hops. The end result is a sweet, refreshing beer that is light on the palate but long on complexity. It's about time I got around to this one—let's get to it, shall we? Appearance: A slightly hazy, golden-amber colored body with a massive and sticky off-white head. Great lacing. Aroma: An overabundance of candy-like cherry. Some definite wheaty beer underneath, but the balance is out of whack. Taste: The cherry flavor is certainly in the spotlight here and almost reminds me of cherry cough syrup. Underneath, there's a firmly subservient and very average wheat body. Sweet, but not too cloying. Lingering aftertaste of cherries. Mouthfeel: A medium-light body with sharp carbonation. Drinkability: If you're not put off by the strong cherry flavor, rather good drinkability. Verdict: As wrong as it seems, there is something pleasant about the cherry flavor. However, it still seems much better suited to the candy world than the beer world. This is a very strange beer, and I find it hard to rate. All I can really say is that while I certainly don't love it, I don't absolutely hate it either. I suppose that makes it average.